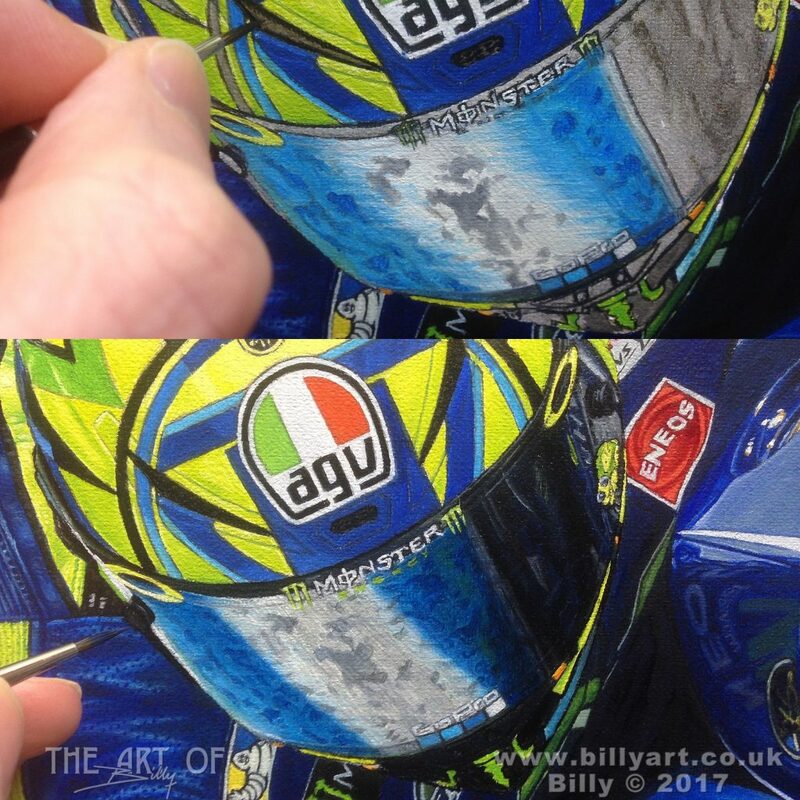 Here is a little update of me starting to detail up Valentino Rossi’s 2017 MotoGP AGV crash helmet and visor on my oil painting. 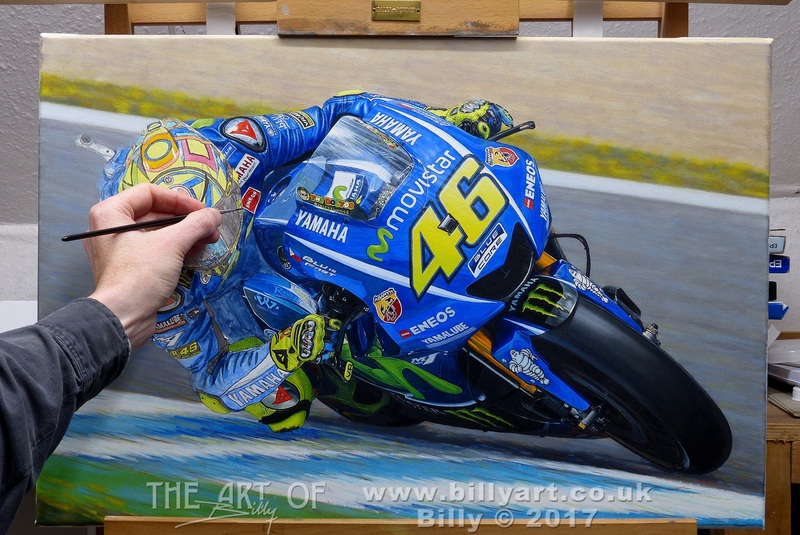 This entry was posted in Motorcycles, The Art of Billy Blog and tagged Billy Art, billy the artist, MotoGP, Oil Painting, Rossi, Valentino Rossi, Yamaha on 18/09/2017 by billy. It is lovely to do the reflections in the metal that contrast with the folds in the leather. Below the Detail image is a full picture of the Rossi art so far. Valentino Rossi 2017 Yamaha MotoGP oil painting by Billy. Detail of the Dainese Race Leathers left shoulder. Valentino Rossi 2017 Yamaha MotoGP oil painting by Billy. The full art so far. 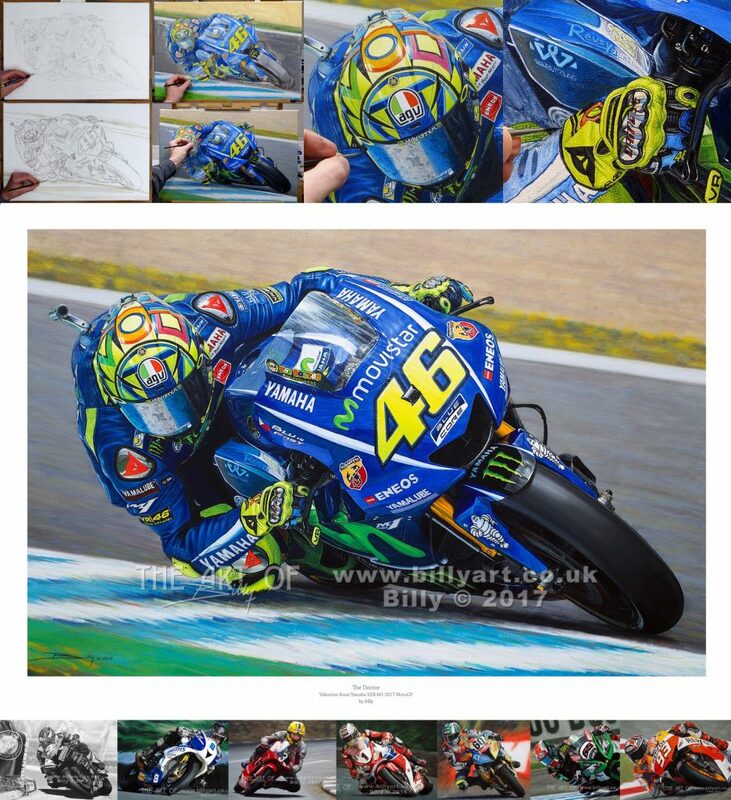 This entry was posted in Motorcycles, The Art of Billy Blog and tagged Art, Billy Art, billy the artist, MotoGP, Oil Painting, Rossi, Valentino Rossi, Yamaha on 08/09/2017 by billy. Here is my Valentino Rossi 2017 oil painting WIP update. The Yamaha YZR M1 MotoGP prototype race bike is complete and so are Rossi’s Danes gloves. Just The Doctor’s leathers and AGV crash helmet to go now. This entry was posted in Motorcycles, The Art of Billy Blog and tagged AGV, Dainese, MotoGP, Oil Painting, Valentino Rossi, Yamaha on 23/08/2017 by billy. 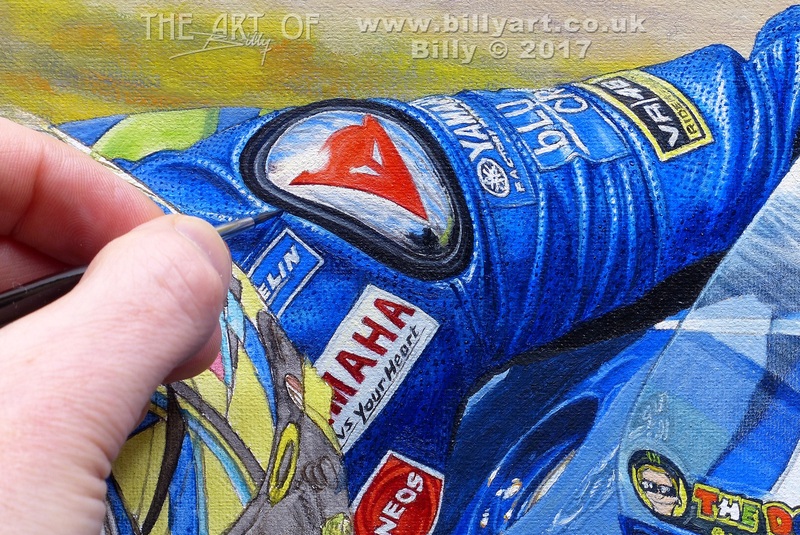 Here is a quick little update on my new Valentino Rossi ‘The Doctor’ oil painting of him on the 2017 Yamaha YZR M1 MotoGP prototype race bike. This little shot shows the pencil line, then turps in first with a brown line to seal the graphite and then washed in with very thin oil colour to give the canvas a tooth for me to add the background and detail layers to the painting. 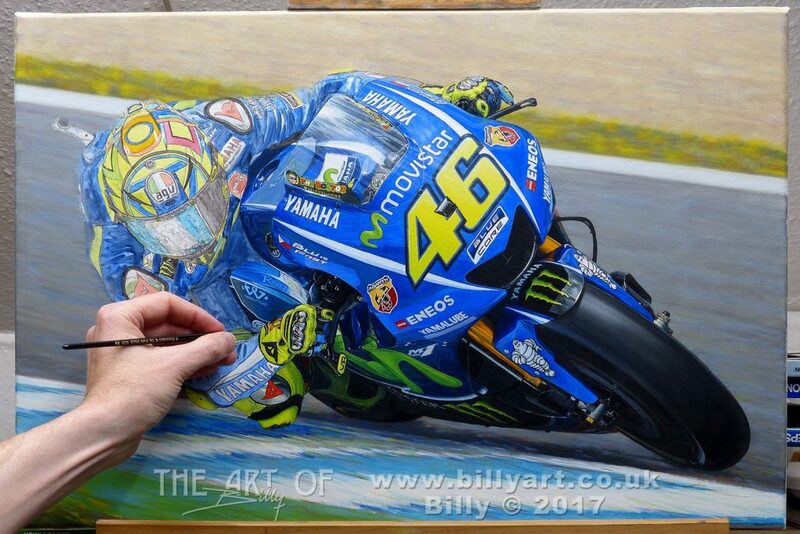 This entry was posted in Motorcycles, The Art of Billy Blog and tagged Art, Billy Art, billy the artist, MotoGP, Oil Painting, Rossi, The Doctor, Valentino Rossi, Yamaha, YZR M1 on 03/07/2017 by billy. 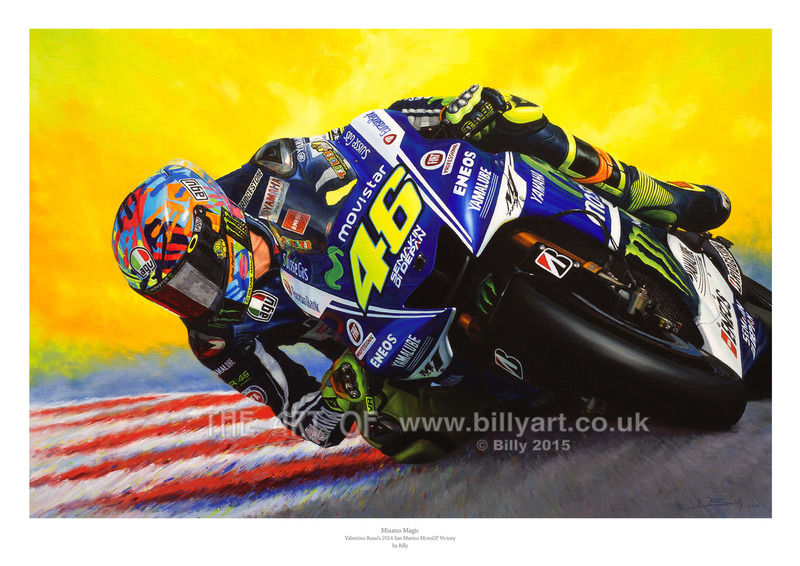 At last here is my new fine art print taken from my oil on linen canvas painting of ‘The Doctor’ Valentino Rossi at his fist win for the Yamaha MotoGP team since 2010. The fine art prints are available as a limited edition of only 100 copies in either A4, A3 or A2 size and cost £20, £30 and £40 respectively with free UK post and packing. 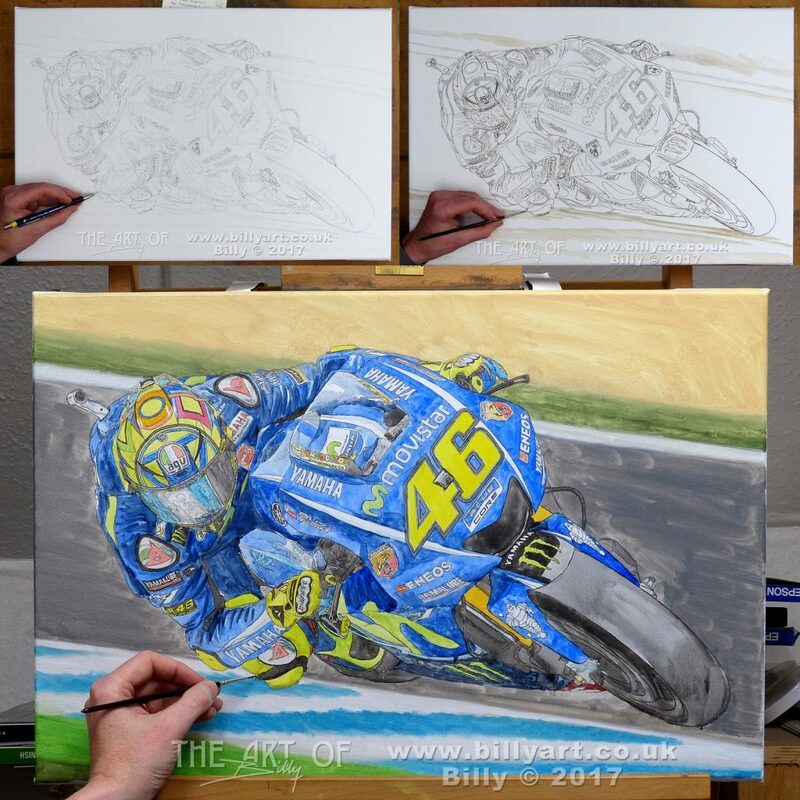 This entry was posted in Motorcycles, The Art of Billy Blog and tagged fine art prints, Rossi, Valentino Rossi, VR46 on 19/05/2015 by billy.